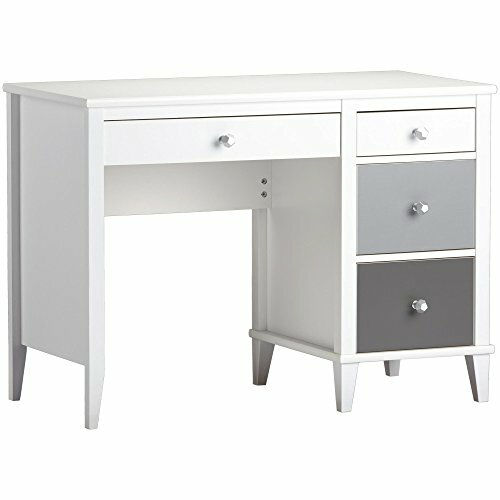 Graduated gray ombre-styled drawer fronts give this classically-styled desk an updated look. Different sized drawers hold everything from pencils to craft supplies and fitted with metal slides and built-in stops designed for trouble-free use. We include two sets of drawer knobs so that you can customize the look of your desk. Like all Little Seeds products, this purchase helps support a major environmental initiative. Discover how this can help you and your child involve your community in habitat rebuilding. Different sized drawers hold everything from pencils to craft supplies and fitted with metal slides and built-in stops designed for trouble-free use. Stability tested to meet or exceed tip standards.